Girls get a glimpse of what college life is like at Clemson. 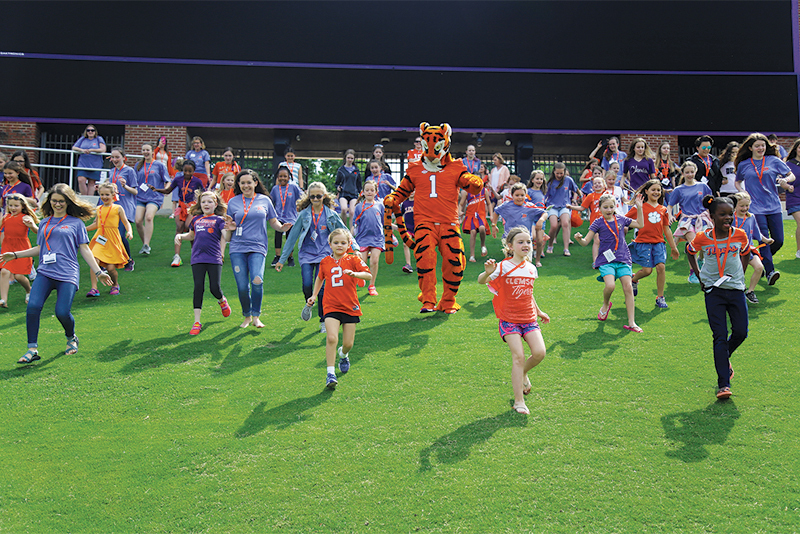 The Women’s Alumni Council celebrated the 20th annual Bring Your Daughter to Clemson weekend on May 18-20 with 132 girls ages 6 to 18 and 117 chaperones. As has become tradition, those in attendance stayed at Stadium Suites residence hall and took tours of Tillman Hall bell tower, the Watt Family Innovation Center, the Fort Hill mansion, Lee Hall, and athletics and academic facilities. They also had an overall campus tour by the CU Tour Guide Association. To signify the 20th anniversary, they planted lilies around the Class of ’56 Academic Success Center. The weekend concluded with the Breakfast of Champions in the WestZone and running down the Hill. Always one of the most popular campus events, registration filled up in record time.